I noticed several musical instruments of various sorts as the Preacher stopped his reading and the clerk announced from the choir: "Let us Praise God by singing the forty-seventh Psalm, Awake, our hearts, awake with joy". How peaceful and heart-uplifting it was to hear vocal and instrumental music in this little country church, not made by hired musicians but joyfully offered by the happy dwellers in the place in praise of their God. West Gallery Music is the music which was performed by choirs of rural parish churches and non-conformist chapels during the Georgian period, from about 1720 to 1850. 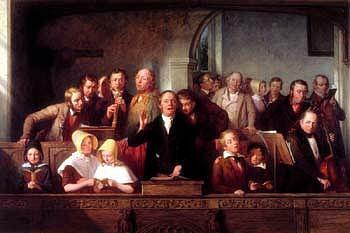 In the early 18th century, choirs of men and boys were formed to lead the singing during services and sang mostly in three and four parts, usually from a gallery at the west end of the church or chapel. 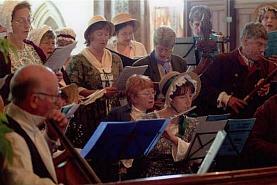 As the century progressed, a variety of instruments were brought in to accompany the singers so that by the end of the century, the choir consisted of singers and a small orchestra; Thomas Hardy referred to the group as a 'quire'. 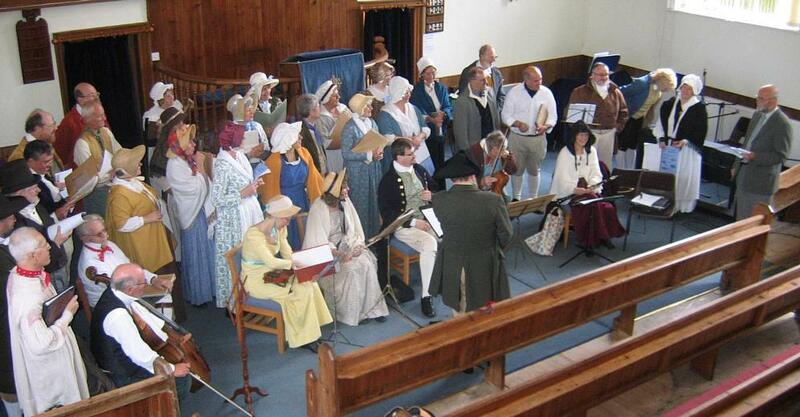 The quire members came from the local community, farmers, shopkeepers and tradesmen, some of whom were musically literate, while others learnt their parts by ear, but all sang with energy and enthusiasm. The instruments included flute, oboe, clarinet, bassoon, violin and cello (often referred to as a bass viol) and possibly even a serpent. The musicians may have played for social dancing in their village as well, and this gave the music a lively and exciting quality. The demise of such a band and its replacement by an organ played by the village school teacher forms part of the story of Thomas Hardy's novel Under the Greenwood Tree , no doubt based on Hardy's local knowledge; his father and grandfather both played violin in the church band at Stinsford in Dorset. Most of the contemporary comments about country church quires are not too favourable but it was so common place that the average or good quires never received comment, and it is probably a case of bad news travelling faster than good news. It is, however, clear than many churches had competent choirs and money was expended not only on music books and instruments but on payments for teachers and on annual dinners, usually referrred to as the "Singers' Feast". 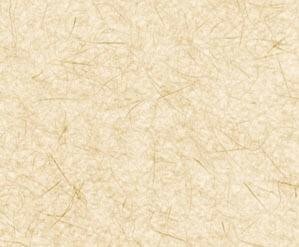 See Research page. 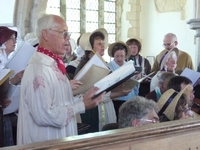 Some choirs became rather self-important and came into conflict with the minister or church officers , which only fuelled attempts by the gentry and clergy to reform the music, usually by installing an organ or, if funds didn't permit, a harmonium, often played by the vicar's wife or the school teacher . No doubt there was an element of class struggle at work here.